Taking a bite in Foster’s Hollywood after enjoying the premiere of a movie in any of the movie theatres in Cinesa Manoteras is a great plan for a date with your friends, family or as a couple. You cannot leave the Manoteras Cinemas & Restaurants Centre without trying a hamburger, some tex-mex style spicy chicken wings or a good barbecue from this Foster’s Hollywood in Madrid. 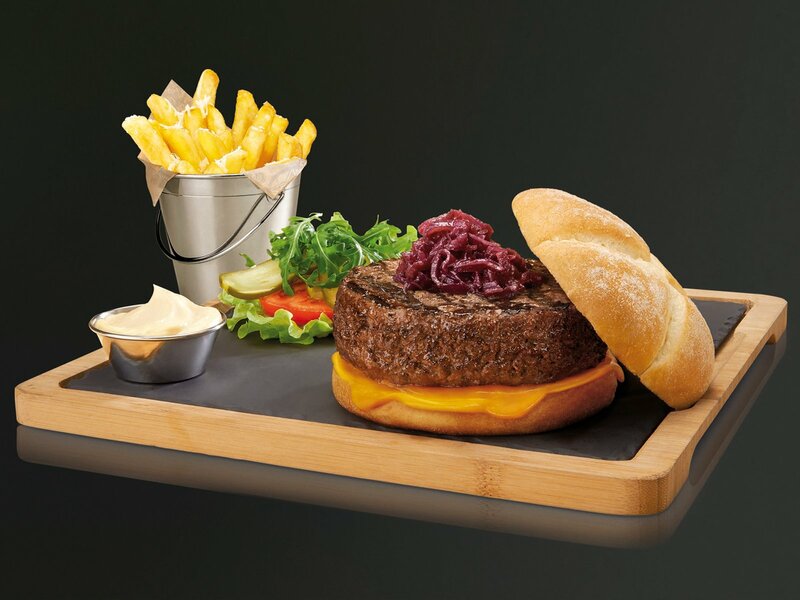 The Foster’s Hollywood chain is undoubtedly part of the select group of the best hamburgers in Madrid. Therefore, it had to be present among the restaurants in Cinesa Manoteras Centre. It is a real experience that takes us to a cinema set in the City of Angels. The movie posters, the cutlery, the music, all the decoration of the place and especially its typical dishes from the United States remind us of what we have seen a thousand and one times on celluloid. In short, going to eat or dine at Foster’s Hollywood will mean enjoying an authentic American restaurant in Madrid. In the early 70’s, a group of Americans settled in the Spanish capital craved to eat the same they did in their homeland. They missed their barbecues and their traditional burgers. Therefore, they decided to create nonetheless than the best hamburger in Madrid. That was the first Foster’s Hollywood and hundreds of them have sprung up all over the country since. And among them is the Foster’s Hollywood Manoteras Cinemas & Restaurants Centre that we are talking about here, which invites you to live the experience of spending an afternoon like an American. By the name of the venue, Foster’s Hollywood, you can imagine that much of the decoration has to do with great movies. In fact, upon entering the restaurant you will remember some classic films you’ve watched on screen. The Hollywood atmosphere characterizes the venue, but that’s just what you see. The best is what you smell and taste. That is, the menu at Foster’s Hollywood Manoteras. Let’s start with one of the star products of our restaurant. The extensive hamburger menu. How do you imagine the best burger in Madrid? At Foster’s Hollywood you will find it. With the different melted cheeses, with smoked flavour, truffles, … We even have a vegetarian option, so that nobody is left out from tasting Foster’s burgers. The second specialty in Foster’s Hollywood is the meat, most of it made on our charcoal grills. That’s where our most emblematic dish is cooked: ribs or American ribs. But our steaks of different weights accompanied by different sauces are also made here. In short, everything you want from an American restaurant in Spain. Our chicken meats can also be grilled. We can serve them with pasta, with wok-cooked rice or on teriyaki skewers too. Foster’s Hollywood’s cuisine is the most typical of the United States, but we are also experimenting with those flavours that you’d love to try and that are the result of the fusion of traditions. An example of this fusion is our tex-mex cuisine, another of the characteristic options on our menu. This type of dishes has always been present in our restaurants in Madrid, but now they are more effective than ever and are the most demanded by our customers. Tacos, fajitas, burritos or enchiladas; give your dinner a good start with a good guacamole made on your table, these have almost become as popular as Foster’s Hollywood’s famous burgers. These are all the flavours that we can offer you in our restaurant next to the lounges of the Manoteras Cinemas. A great idea to merge the best cinema on Madrid’s box-office and a good hamburger or grilled meat. We’re waiting for you to live your own Foster’s Hollywood experience in one of Madrid’s best hamburger joints!